When you want to sell gold and silver coins we are the first choice as coin buyers of all denominations and all periods. Tel 0121 448 0488 for more info. We also buy probate coins in silver and gold. When you want to sell gold and silver coins please be aware that many coin dealers offer good prices on the phone, but as soon as they have your coins in their hands they start to reduce their offer based on condition. Many pay below scrap silver or gold price and that way if they cannot sell the coins as collectables they make their profit by scrapping them in with Gold and Silver buyers like us. Therefore our advice when you want to sell coins is to cut out the middle-men. We pay our calculator price regardless of condition . More often than not we pay a great deal more for gold and silver coins than coin dealers who tend to offer below scrap. That way if they cannot sell them as collectables they sell them on to us. Gold coins we buy include Sovereigns, Half-Sovereigns, Krugerrands, Angels, Guineas, Maples, in fact we buy all gold coins regardless of condition. NB British Silver coins TO compare our coin prices with a "£1 face value" offer from a coin dealer just get our gold and precious metals price calculator price for 112 grams after selecting the purity of your coins eg 925 for pre-1920 coins and 500 for 1920-1946 coins. As at 02/03/2018 we were paying 20 times face value for 50% coins and 40 times face value for 925 or sterling coins. Prior to 1920 British silver coins contained high purity, 92.5% (Sterling) silver. From 1920 to 1946, British silver coins contained 50% silver. From 1947 onwards, some denominations of British pre-decimal coins issued for circulation were "silver-colored," however these coins were made of copper-nickel, and contained no silver. 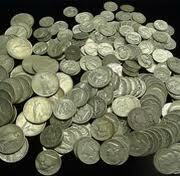 We also buy US coins (normally 900, 90% silver pre 1965) and European and World coins Phone for more info. CENT: United States of America, Sierra Leone, China, South Africa etc. CENTAVO: Many Central and South American countries, Cape Verde, Philippines etc. THALER: Bohemia, Germany, Hungary, Roman Empire, Prussia etc.